Yesterday night, I had the opportunity to attend the media preview of Alberta's latest Smashburger location - in Sherwood Park! 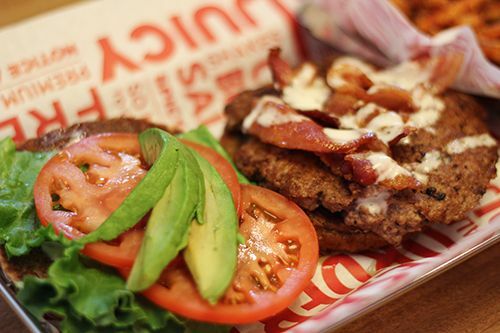 While Smashburger is no stranger to Americans (it's originally from Denver! ), this location is the third in Canada, and a sign of many more locations to come across our country. 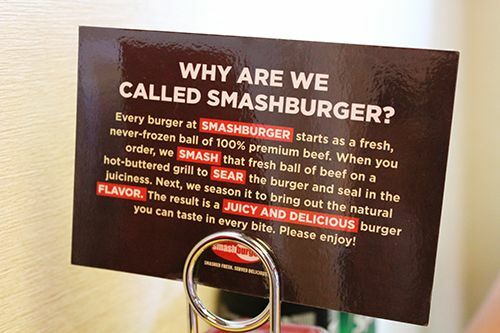 So as it is explained by the sign, the cooking technique is what makes Smashburger different from all the rest. 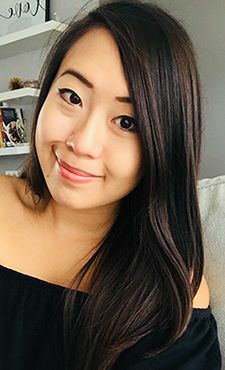 I had the opportunity to speak with the owner, Lin, for a bit and I was told that the beef they are using in their burgers is never frozen. It is brought in fresh to the store, and allowed to stay in the fridge for a maximum of two days. If it isn't used up within those two days, the beef is discarded to ensure that all the patties they make in store are fresh for customers to eat. 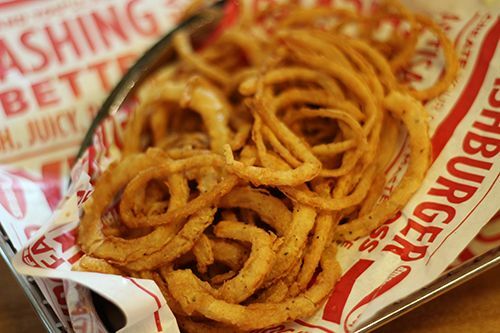 Ordering is simple. You walk in, take a look at the menu, and then you're given a number to bring to your table which specifies your order number. Once your food is ready, a server will bring it to your table, so it's a semi-serviced dining experience. This particular location has a smaller menu than other locations, so I was a little disappointed to find that items such as their deep fried pickles and chili weren't available for ordering. Nonetheless, there are tons of options on the menu, or you can build your burger to your liking, which gives tons of variety and flexibility to patrons. I was able to bring guests with me to try out the restaurant, so of course we tried lots off the menu. 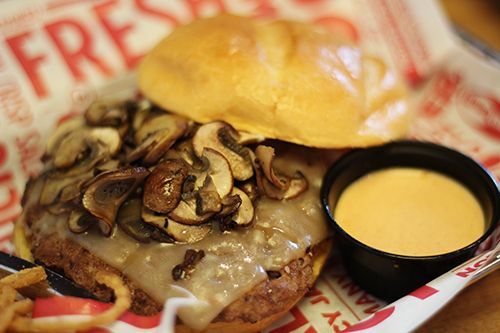 The Truffle Mushroom Swiss Smashburger ($6.99 reg) - Truffle mayo, sauteed baby portabella mushrooms and aged Swiss on an egg bun - had a nice truffle flavour to it, but the bun was quite oily. We also tried out the Avocado Club Smashburger ($6.99 reg)- Fresh avocado, applewood-smoked bacon, lettuce, tomato, ranch dressing and mayo on a multi-grain bun - which had a nice creaminess from the avocado and flavour from the bacon, but it didn't feel heavy since there was the lettuce and tomato in the burger to complement it. For myself, I had the Spicy Baja Smashburger ($6.99 reg) - Fresh jalapenos, guacamole, pepper jack, lettuce, tomato, onion and chipotle mayo on a spicy chipotle bun - which I really enjoyed. The fresh jalapenos really gave the burger a kick, but the spiciness wasn't so overwhelming that you couldn't taste anything else. It's a burger with heat to it, and I do recommend it if you love spicy food. To test what else the menu had to offer, we ordered the Avocado Club Chicken Burger with grilled mushrooms on it ($8.49 + $1). The chicken used in the burger is a seasoned, grilled chicken breast, which was quite juicy and tender. 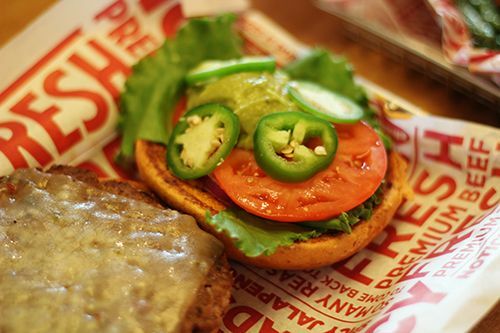 The flavour profile matched the Avocado Club Smashburger, and the only difference was the protein. If you're health conscious, the chicken burgers are a nice option. 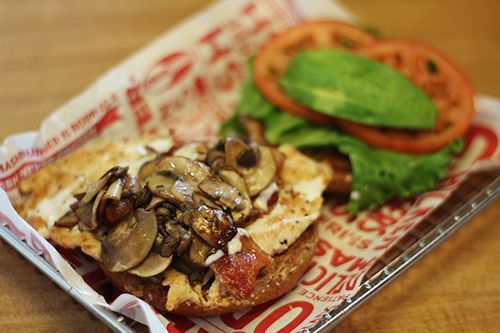 For our last burger, we chose the Edmonton Smashburger, but substituted the patty with chicken breast. 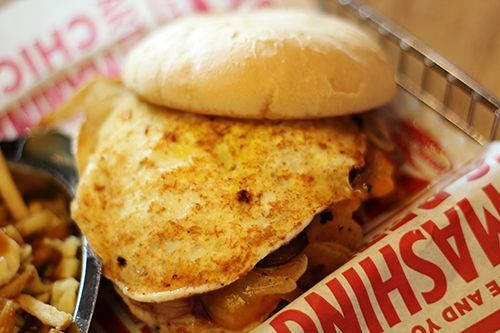 The Edmonton Burger - Canadian seasoned grilled onions, cheddar cheese, Canadian BBQ Sauce, and fried egg on a Kaiser roll - is special to this menu, and I think it's neat that Smashburger tries to cater the menu to the local population. This burger isn't available down in Calgary either, as their Calgary burger is quite different from this one. The Edmonton Chicken Burger was juicy and tender, and the BBQ sauce was smoky but not overwhelming. I just wish that the egg was fried sunny side up! And of all the buns tried that night, I actually found the Kaiser roll to be my favourite. It was really soft, and not too dense, whereas some of the other buns we tried were. Now you can't have a burger without sides! 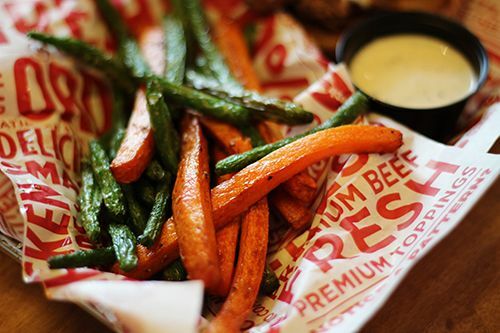 I was a little bit disappointed in the selection of sides, because I had taken a look at a different menu and found that this particular location doesn't offer as many choices as other Smashburger locations. For example, they don't have the fried pickles or the chili, but they at least offer 6 choices - and of course I had to try them all. The Veggie Frites ($3.99) are flash fried carrot sticks and green beans - they were a little limp, but seasoned nicely and quite addictive. It's their "healthy" alternative to fries - but how much healthier are deep fried carrots than deep fried potatoes? The Haystack Onions ($2.49) were very thinly sliced and battered onion rings, which were crisp, but became soft and oily in no time. They were also very salty, so I would skip these if you're looking for onion rings, or you're trying to be health conscious. They would be delicious inside of a burger though! Smashburger's Sweet Potato Fries ($2.99) were skinnier than most I've tried, but they were crisp and tender, and served with an aioli that had a strong horseradish flavour to it. At most restaurants, sweet potato fries are typically $1+ more than regular french fries, but the two sides differ by $0.50, so you do get a great value for getting sweet potato fries. The Smashfries ($2.49) were something I was quite looking forward to: shoestring fries tossed with rosemary, olive oil and garlic. 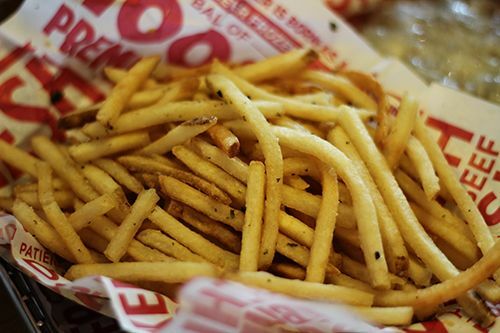 The fries were golden, crisp and tender, and the seasoning hit the spot. The fries weren't salty, so the rosemary and garlic were able to speak for themselves. I'd have to say this side was my favourite of them all, and it wasn't just me that liked them! They disappeared from the table in the blink of an eye. 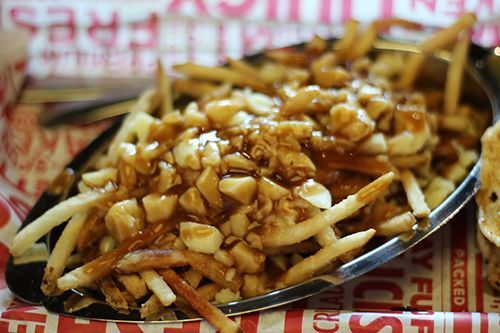 Last but not least, we tried out the traditional poutine ($4.49). The gravy was quite salty, and having the gravy poured overtop of salted fries was a salt overload. If the shoestring fries weren't salted, I think this poutine would've been alright. Unfortunately, there weren't any shakes or malts available to order yesterday night, but I did get the chance to sample the Saskatoon Berry Shake and the Chocolate Shake. Both were thick, creamy and not too sweet, and would be great accompaniments to burgers in the summer time. So what's the verdict? I quite enjoyed the experience at Smashburger, and would likely return again in the future if I was nearby and craving a burger. But would I drive the 30 minutes from my house to this location in Sherwood Park just for the sake of a burger? Probably not. Open a location close to me and I would be there! The environment is clean, the staff are friendly and helpful, and the burgers here are fresh and have juicy patties. Not too shabby if you ask me. 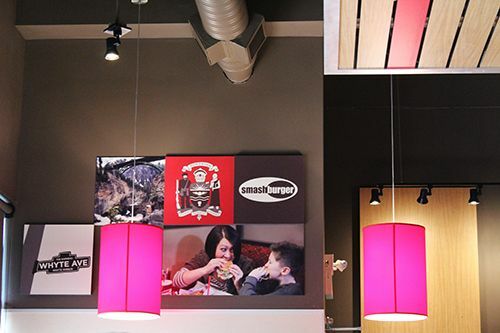 This Smashburger location officially opens today, so go check it out if you're in the area! I wonder what they mean by "discarding" the meat after 2 days. yummmm looks so good!! i love smashburger!! 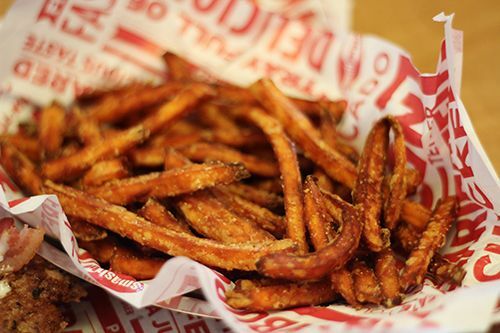 yumms i love sweet potato fries! I want a burger now! their selection of burgers looks so amazing! i love that the ingredients and beef is fresh. so awesome. great review andrea! i am not a meat eater, but those fries... they got me! and those fried veggies look amazing, but you are right they are not much healthier than the potatoes (just a tiny bit! ).